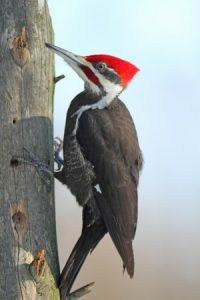 Spotting a big pileated woodpecker in a tree might be a thrill for birdwatchers, but these birds can also become something of a nuisance to homeowners. Although woodpeckers will rarely damage healthy trees, they can harm trees that have already been weakened by disease or insects. They may also peck holes in homes with wood siding as well. Fortunately, there are a few strategies you can use to keep woodpeckers away from your home without harming any birds in the process. If a tenacious woodpecker has started hammering away at your home, your best bet may be to offer them a more attractive place to forage for food. You might be able to lure them away with a bird feeder placed near the edge of your property, for example. If possible, hang the bird feeder from a dead or dying tree that’s a safe distance away from your home. Woodpeckers love to use decaying trees as nesting sites – all you have to do is sweeten the deal with a little snack. Woodpeckers aren’t fond of reflective objects, so you can often frighten them away by hanging old CDs, mirrors or strips of Mylar from the trees or structures they’re targeting. You can even use a wind chime with shiny components to keep woodpeckers at bay while adding a nice decorative element to your property. Predator decoys may also work temporarily, but sooner or later the birds will learn that these decoys are fake. Keep in mind that woodpeckers are protected by state and federal laws, so you should refrain from using traps, pesticides, sticky substances or anything else that might be harmful to the birds. In most cases, a few reflective objects and a well-placed bird feeder will be all you need to keep woodpeckers from damaging your property.